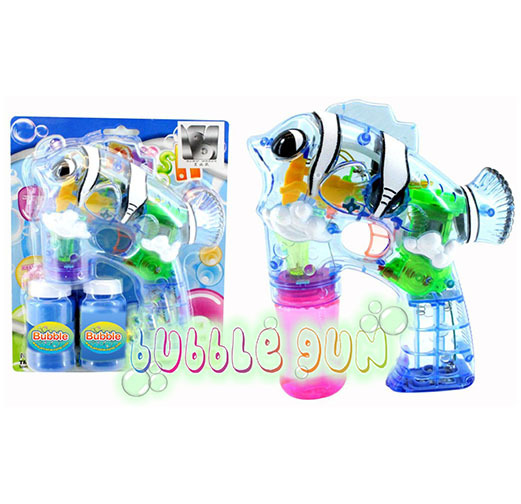 Fill the air with hundreds of small bubbles with this CLOWN CARTOON FISH bubble gun. Has led lights and batteries included. Two bottles of bubbles for each gun also included. 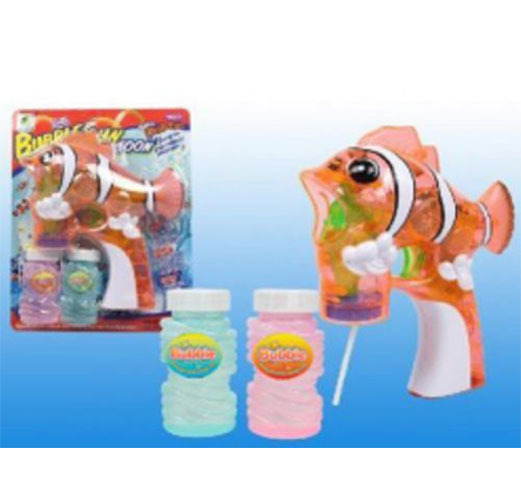 Lightweight, brightly colored bubble gun has a translucent body and a cute Nemo Dory clown fish design in peach color Nemo cartoon fish or blue color Dory cartoon fish. Features led lights, a compact, and an easy-to-grip handle, batteries included. Plays Music! Put the included bottle of bubble solution in the gun, and pull the trigger for hundreds of bubbles while it plays music with four bright led lights! One is even in the mouth of the bubble gun fish so bubbles come out blue. Our bubble gun is very durable. To have the most fun remember to always prime the bubble gun which means keep your finger on the trigger and do this 2-3 times and then bubbles will come out in abundance. We also sell our Nemo Dory bubbleguns wholesale just call 305-785-4048. Children recognize this bubble gun because of the Disney movies first Nemo then Finding Dory which just came out not long ago. Great Bubble gun for parties and party favor! We have clients that bought this bubble gun and have gone to their local pools or at any event and their child became a celebrity. So if you want one of the best and most thrilling bubble guns on the market look no further than this Nemo Dory bubblegun from Whistlecopter.